Summer fruit is here and we can’t get enough strawberries at the market. It is important to know, however, that not all strawberries are created equal. A quick stop by our market and you’ll see 3-4 varieties of strawberries varying in shape, size and sweetness. How do you know which one to pick? 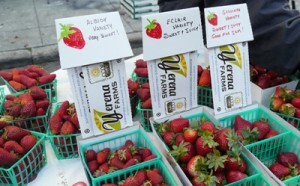 Yerena Farms, challenges you to their Strawberry Taste Test! Compare three varieties side by side and let your taste buds decide! Not only are Yerena’s strawberries delightful, their business practices are also impeccable: Yerena Farms was awarded with the 2012 Outstanding Small Business award from the Monterey Business Council! Come check them out this Thursday at the market!